Some Medical Devices Pose Serious Health Risks | Hupy and Abraham, S.C. It was not a medication that you took to diagnose or treat your medical condition. Instead, doctors recommended a medical device that you agreed to use. Medical devices range from very simple products to very complicated machines. Like medications, medical devices are regulated by the Federal Drug Administration (FDA); however, unlike medications, medical devices do not trigger a chemical reaction nor are they metabolized by the body. Power morcellators. These medical devices break up tissue that needs to be removed from your body before it leaves your body. This allows for a smaller incision and less recovery time, but it could result in cancer spreading if the tissue that was broken up was cancerous. Gastrointestinal scopes. GI scopes are used in the diagnosis and treatment of some gastrointestinal conditions. However, it is alleged that the design of the scopes allows bacteria to get into the devices and to be passed from patient to patient. Transvaginal mesh. Transvaginal mesh is a medical device that is used to treat stress urinary incontinence and pelvic organ prolapse. Some women, however, have suffered significant injuries, and the FDA reclassified this type of medical device to high risk in 2016. DePuy metal-on-metal hip implants. DePuy’s ASR and Pinnacle metal-on-metal hip implant lines have been linked to metal poisoning and premature failure. Significant recoveries have been made by some of the injured victims. Biomet metal-on-metal hip implants. Magnum M2a hip replacements, made by Biomet, caused injury to some patients when the metal parts of the hip implants rubbed together. Metal poisoning and premature hip failure occurred and some patients recovered compensation for their injuries. Overactive bladder treatments. An overactive bladder is a medical concern, but treatments such as Botox and Oxytrol patches have led to serious complications. Da Vinci surgical robots. 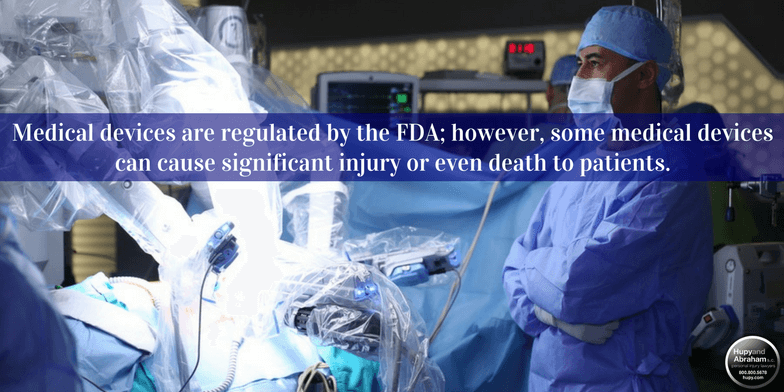 Serious injuries such as bleeds, burns, and infections have been reported from these surgical robots and, as of early 2017, personal injury lawsuits were pending in court. Bair Hugger™ surgical warming blankets. It can be difficult to maintain your own body temperature during surgery, but it is important to prevent hypothermia. Bair Hugger™ warming blankets are designed to help patients maintain body temperature, but their design may also allow surgical sites to become contaminated with bacteria. NuvaRing contraception. Some women have suffered blood clots after using this form of birth control. IVC filters. These medical devices are used to prevent blood clots from entering the lungs. However, if they are left in the body for too long, then they can migrate or break apart and injure the largest vein in the body. Lawsuits are currently pending for some people hurt by some of these products. Other people have already recovered damages, and others have been hurt and not recovered anything. Whether you have been hurt by one of the medical devices on this list or another defective medical device, you need to take action as soon as possible to protect your rights. Your time to file a lawsuit is limited by the Iowa statute of limitations. Accordingly, we encourage you to contact us via this website or by phone at your earliest convenience. We would be pleased to schedule a free, no-obligation consultation with you.